Arizmendi, C.; Giraldo, B.; Acevedo, H.
The process of weaning from mechanical ventilation is one of the challenges in intensive care units. In this paper 66 patients under extubation process (T-tube test) were studied: 33 patients with successful trials and 33 patients who failed to maintain spontaneous breathing and were reconnected. Each patient was characterized using 7 time series from respiratory signals, and for each serie was extracted 4 statistics data. Two types of Neural Networks were applied for discriminate between patients from the two groups: radial basis function and multilayer perceptron, getting better results with the second type of network. Arizmendi, C. [et al.]. 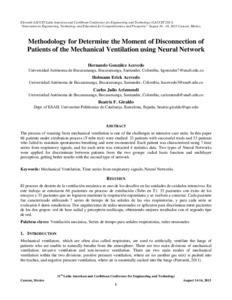 Methodology for determine the moment of disconnection of patients of the mechanical ventilation using neural network. A: Latin American and Caribbean Conference for Engineering and Technology. "Eleventh Latin American and Caribbean Conference for Engineering and Technology (LACCEI’2013)". 2013, p. 1-6.